Chalet Keira is a beautiful, new 10 bedded chalet situated in a quiet residential area of Chamonix. 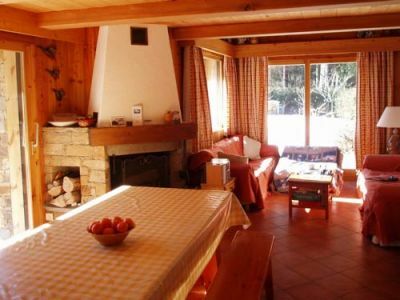 It is within easy walking distance of Chamonix town centre and the Chamski bus stop. It is a 10 minute flat walk along the river into Chamonix centre. The catering is "good home cooking" and gets rave reviews on tripadvisor and google alike. Our famous cakes are always there for afternoon tea. The chalet has a cosy relaxed atmosphere and we do our utmost to make guests feel at home. Large, open plan living, dining and kitchen area with log fire. Large patio doors give spectacular views of Mont Blanc. 1 double room with mezzanine. 1 bathroom with shower and two basins. 1 bathroom with bath and 2 basins, 1 separate W.C.
Other Facilities: Ski storage area with heated boot warmers, Storage area for bikes and outdoor equipment, Large private garden with superb views. BBQ and outdoor garden furniture for the spring. Private car parking outside the chalet. Free WIFI. The chalet is located in Les Pelerins. Les Pelerins is a suburb of Chamonix town and spreads over a several square kilometres just South West of Chamonix Sud. 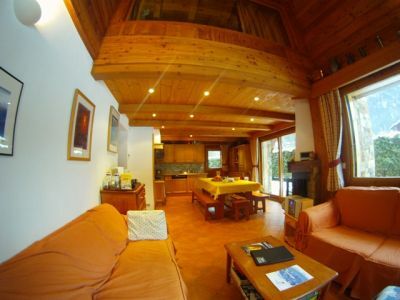 Chalet Keira is the ideal ski chalet for those looking for a relaxing ski holiday. Catered with delicious home cooked food, this chalet offers a cosy relaxed atmosphere only 10 minutes away from Chamonix centre.